Mice infestations are one of the hardest wildlife problems to solve. Many people mistakenly believe that a mouse problem can be quickly solved with a few traps and some poison, Why traps and poison don’t work. This approach ignores the roots causes of infestation and is far too simplistic to provide real results in the long-term. The most effective way to permanently keep mice out of your home is through exclusion. This process requires more work and may take longer but it is the only effective solution. While there are many things homeowners can do to help, the experienced eye of a trained professional can save you a lot of headaches. The first step to getting rid of mice is to perform a complete top to bottom exterior inspection of the home. Without identifying how the mice have entered the home, no amount of poison or traps can stop all the other mice in your neighbourhood from returning. Mice are very small rodents capable of squeezing into any crack or crevice larger than one 1/4-inch. For this reason, the inspection must be extremely thorough. Using a flashlight your Skedaddle wildlife technician will begin by inspecting the entire base of your home, gradually working up the walls and eventually up to the roof. Mice are excellent climbers and will very often find their way into a home through areas that are well above ground level. It is important to check the garage interior as mice will often chew or slip past garage door weather stripping to get in. 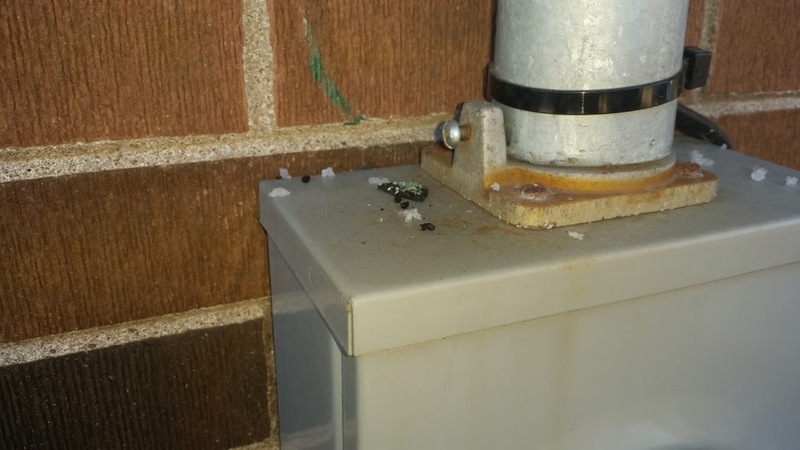 Mouse droppings on top of a hydro meter. When inspecting your home for exterior mouse entries be on the lookout for droppings. Mice produce 50-75 droppings per day. These droppings will accumulate in areas where mice are spending time, especially near nests, food sources and along travel routes. Collections of droppings near access points to the interior of your home are an excellent indicator. 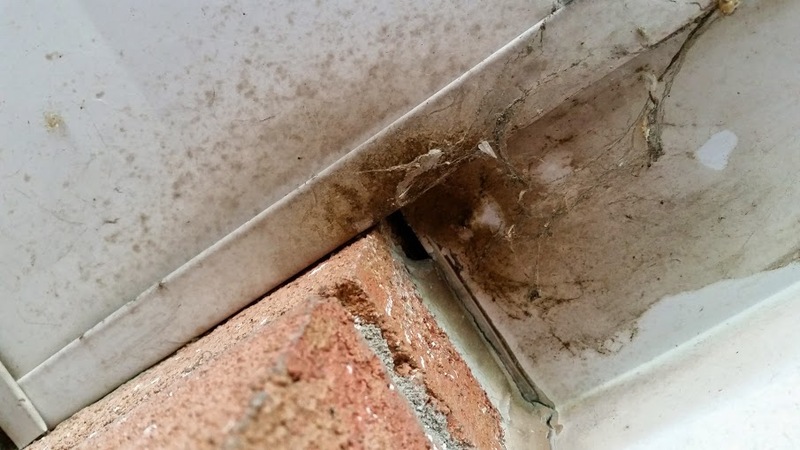 A mouse entry point through chewed caulking – stained brown from frequent activity. Mice have very oily fur that helps them squeeze into tight spaces. Well-used mouse entry points will be surrounded by a distinct recognizable brownish-gray staining. Mice will also leave fur behind as they push themselves through a hole. 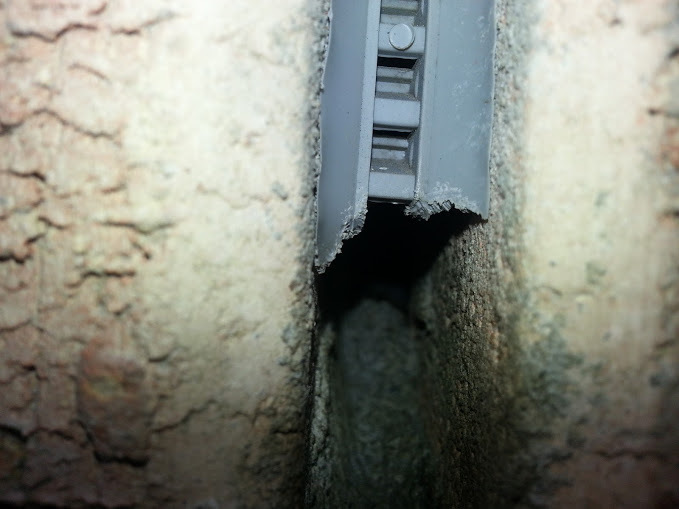 A chewed weep vent cover where mice enter brick walls. A closer look – you can see the teeth marks. 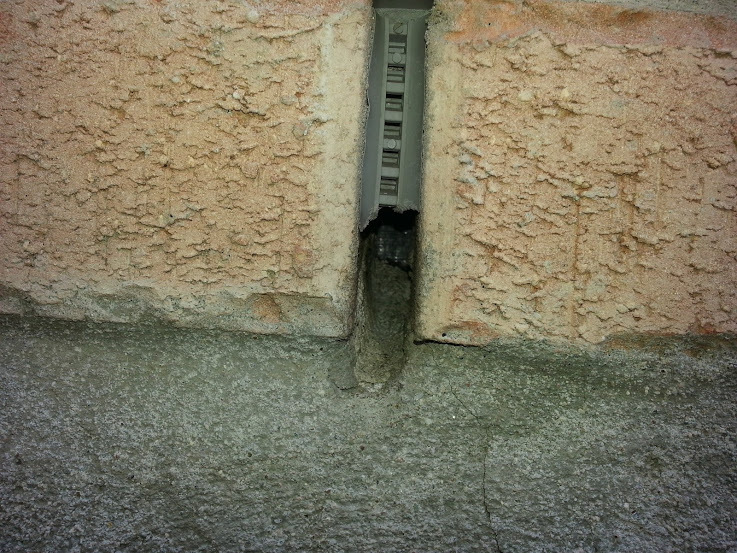 Mice will very often chew exterior building materials to either create a brand new entry to expand an existing crack of crevice. Mice chew circular holes through thin aluminum, plastic and wood. These holes can often be identified by tiny gnaw marks that are 1/32-inch wide. To remove the mice still inside your home, Skedaddle installs one-way doors over the entry points. One-way doors allow the mice to exit your home as they normally would in search of food, only to lock them out in the process. 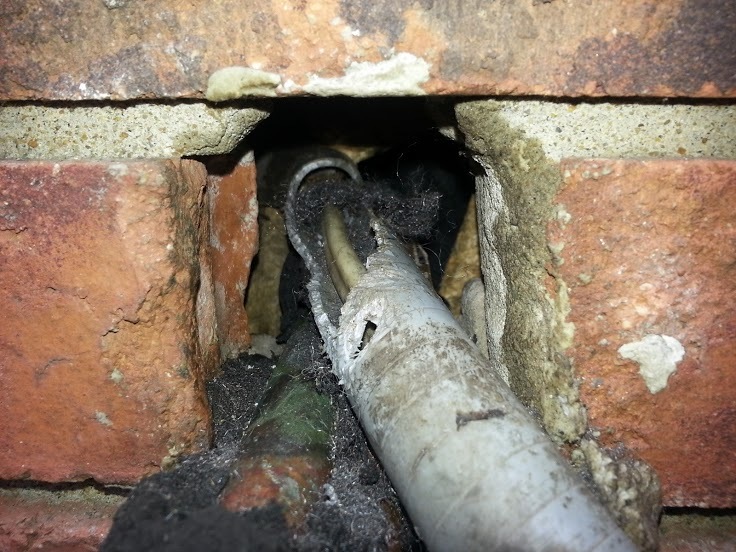 A mouse entry point through a hole for the air conditioning line. As part of Skedaddle’s multi-faceted approach we will then identify and seal any potential mouse entry points on your home. Click here to learn how Skedaddle Prevents and Protects against mouse infestations. The mice inside your home will have stored food in the walls and attic. To speed up the removal process it is important that all food sources inside the home are properly secured. This forces the mice to exit and the home, humanely getting rid of your mice in a matter of weeks. If you have tried exterminators, traps and harmful poisons and cannot seem to rid yourself of mice be sure to call Skedaddle today. We will customize a program guaranteed to humanely solve your mouse one and for all.